Three months after the release of “Urban Mermaid“, Hawaii-raised Japanese pop singer Yuna Ito (24)will be releasing her 10th single entitled “Anata ga Iru Kagiri ~A WORLD TO BELIEVE IN~” a Japanese/English duet with no other than International Superstar, Canadian singer Celine Dion (39). The song is a Japanese cover of Celine Dion’s “A World To Believe In” from her newly released album TAKING CHANCES. The recording and promotional video (PV) was film in Las Vegas last month and will be the new LISMO CM theme song. The single will be released next year on January 16th under the Sony Music label. Debuting at #3 on the Oricon Daily Single Ranking is the new single from the Hello! Project unit Berryz Koubou entitled, “Tsukiatte Iru noni Kataomoi”. Their 15th single come just after five months since “Kokuhaku no Funsui Hiroba” which debuted at #4 on the Oricon Weekly Single Ranking. Berryz Koubou is a seven-member group made up of girls from Hello! Project Kids and first debuted with the single “Anata Nashi de wa Ikite Yukenai” back in March 2004. Yuna Ito’s next single will be a duet with Celine Dion entitled “Anata ga Iro Kagiru ～A WORLD TO BELIEVE IN～”, which will be released on Jan. 16, 2008. It will be the new au LISMO CM song that will air on December 1st. Germany’s all-female Japanese Eurodance group SHANADOO will release their new single, “THINK ABOUT” (originally entitled “Think About The Omen”) and second original album “THE SYMBOL” (originally entitled “The Omen”) on the 7th of December. The single and album will be released under Icezone Music (Universal) in Germany and other European markets. Just like their previous single, “Japanese Boy“, this will be their second release sung entirely in English that will not be a cover of any E-ROTIC songs. Getting into the Winter spirit, Japanese pop singer Tamaki Nami (19) will be releasing her 15th single, “Winter Ballades” the day after Christmas. The second track, “Christmas Time” was written by Nami herself and will also do a cover of the popular J-Rock band L’Arc~en~Ciel’s 1998 song, “Winter Fall”. Nami debuted with her first single, “Believe” in April of 2003 and recently released the single “Brightdown” back in August of this year. 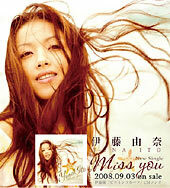 The limited CD+DVD edition includes a music video, mini-photoalbum and super picture label.